Houston Community College Board Trustee Christopher W. Oliver was indicted in the Southern District of Texas on March 9, 2017. In May, Oliver pleaded guilty to count 2 of the indictment. This is arguably the most important public corruption case in the Houston area since Commissioner Jerry Eversole admitted to lying to FBI agents in 2011. One interesting connection – both cases involve the ESPA Corporation. Count 1 of the Oliver indictment contains a weird reference to K.S. – a “victim” who paid Oliver over $77,000. People paying bribes are typically not referred to as victims; so, this is rather curious. Another interesting tidbit is the ESPA Corporation, formerly owned by Harris County Commissioner El Franco Lee, was sold to a man by the name of Karun Sreerama a.k.a. K.S. Former Harris County Commissioner Jerry Eversole was also a paid employee of ESPA Corporation. Sreerama serves on the boards of the Houston Downtown Management District, Houston Community College Foundation, the American Council of Engineering Companies of Houston, and the Indo American Political Action Committee of Greater Houston. All of these affiliations denote lots of money being handed out to politicians, probably for very little work. Think pay to play. In 2011, Mr. Sreerama’s company, ESPA, did a two million dollar facility study for HCC. Basically, he was paid two million dollars to determine whether another HCC campus should be built. The answer is clearly no because HCC cannot fill up the classrooms they have now. Getting back to Mr. Oliver, realize that he pleaded guilty on May 15 in Judge Vanessa Gilmore’s court. 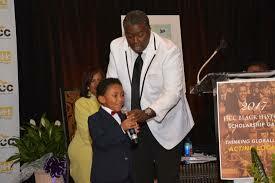 This means that Mr. Oliver has been walking the free earth after pleading guilty to a federal felony bribery charge. 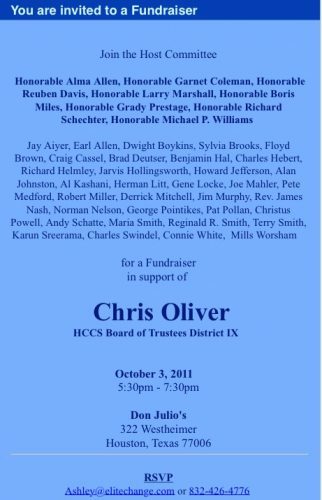 Mr. Oliver has been attending HCC board meetings and voting on board items after pleading guilty to bribery. 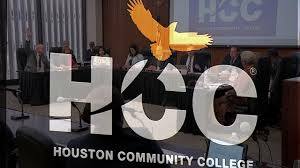 HCC had a board meeting on May 25 and June 15. There was also a board retreat he presumably attended. You can bet your bottom dollar that he was wearing a wire. 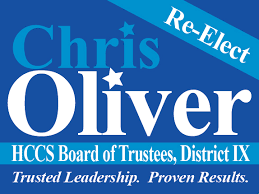 Looking at the board minutes, Vice Chairman Christopher Oliver voted on a number of issues. Reading the minutes Oliver noted that he attended the HCC graduation and various community activities in his district. He left out a few important activities such as his arrest and his appearance before federal Judge Vanessa Gilmore where he pleaded guilty to federal felony bribery charges involving HCC. This will no doubt win him the adoration of his fellow board members. Were they aware of his arrest? Were they aware of his plea? Did Oliver tell Jarvis Hollingsworth, the board’s lawyer, about his arrest and plea? What board votes were taken following Oliver’s guilty plea? Big Jolly politics knows of at least one high profile attorney representing a witness or target of this investigation – not Oliver. It should be noted that on March 17, Karun Sreerama was appointed to be the director of public works and engineering for the City of Houston. Houston Mayor Sylvester Turner, of course, found the best public works director in his orbit. It always depends on what you are looking for in a public works director. Indictment coming next for Stardig, Turner or Givens for the TIRZ 17 mess? Freels? It really seems like fishy business over there. Good to see someone is cleaning things up in the 4th largest city. K.S. was probably wearing a wire (Why referred to as victim), that is how they got Chris Oliver. Chris was the small money man in my opinion the big guys got away. Like some at Enron they knew when to stop and flee. But blame everyone that had the power to stop them, I filed complaints with the State they did an audit, but it was HCC that conducted the audit, they gave themselves a clean bill of health. Same thing with the properties that they were buying at inflated prices, complaints were filed by other persons, again those that could do something, that includes the D.A. chose to do nothing. Mean while the County Attorney chose to waste taxpayer’s money going after Dave Wilson because of his residence. At least one HCC Trustee does not live where they claim that they live. But those are old complaints, Oliver was caught because someone was probably wearing a wire. Somethings I did not say in the article was that this was not filed as a conspiracy case. This prevents heresay from being entered into the case, which is a widely used tactics by the Feds in political corruption cases. You are on to something about Oliver being the fall guy. It could very well be KS set him up and beat a path to the FBI first. I am not sure why his case was handled by the public defenders office. He pleaded guilty very quickly. There are other details out there going unmentioned, kind of waiting to see what happens next. There are very good lawyers who have been retained to represent unnamed participants. The Indictment does mention a K.S. I would not presume that is the named individual that is mentioned in the article by Mr. Hooper. I bet you that I am right. If it is not Karun surely I will hear from him or his attorney today. Twice I have been deposed to get me to stop what I was investigating (both concerning HCC), and you are right about hearing from an attorney, but I don’t wish that on anyone. But Karum was involved with a lot of entities and more than two commissioners. It is the pay to play in Harris County mentality. I think he works for the City now, but I am not sure. But Chris was much closer to another person who also receives a lot of contracts from different entities.